Chartered engineer of Marine Engineering and Naval Architect discipline. He earned his academic degrees in Glasgow and Sunderland, U.K. and served a full five year apprenticeship in Shipyards in Scotland and North England when the international shipbuilding industry was concentrated in these areas. 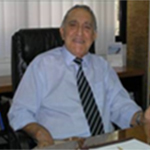 Ηeld leading positions in Ship Management Companies, Shipyards and for over 34 years with American Bureau of Shipping (ABS) from where he retired as Vice President of Eastern Europe and the Middle East, in 1993 and was awarded with a “commendation for notable service”. A brief analysis of the particular areas, advantages and needs for sea transportation of natural gas in compressed form versus pipe lines or liquefied systems. An overview of the presently available sources of natural gas worldwide with particular emphasis to the Mediterranean area. The determination of the areas where CNG transportation can better serve consumers needs where pipe line or LNG systems are not viable or not economical. A detailed description of a Prototype Autonomous CNG carrier vessels which is anticipated to cover the needs that could not be served by the other two systems.